Some time not long ago, the term "dinner and a movie"...evolved. 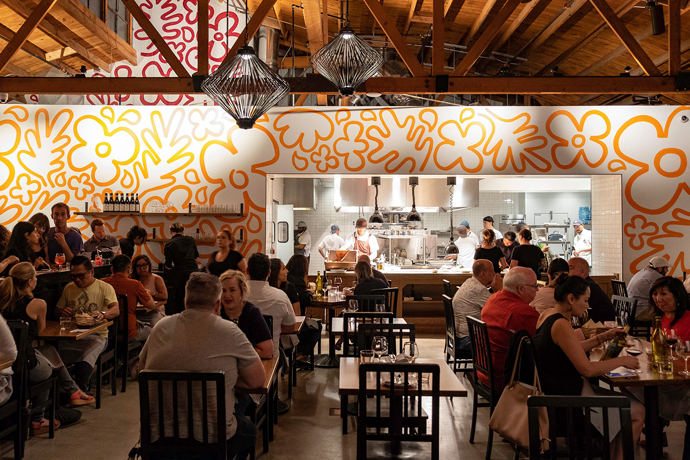 The latest place to greenlight a blockbuster over a meal is Foxtail, West Hollywood's cozy new A-list supper club. Gone is the previous incarnation, Lobby—after a dramatic overhaul, the once-cavernous space now comprises two distinct and separate levels. If you enter the ground floor via the shimmering rainbow-hued corridor, you'll find yourself in the restaurant and lounge—victim of an apparent Art Deco/Art Nouveau/'70s glam explosion. It's engineered by Sam Nazarian and Brent Bolthouse of SBE (Hyde, Area, S Bar, Katsuya), who've rounded up a new gentleman's club of Hollywood bigshot partners—say your hellos to Endeavor's Patrick Whitesell, NBC's Ben Silverman, producer Scott Stuber and the ubiquitous Brett Ratner before settling in. You'll want a seat by the back wall under the mirror, or in the front by the windows, for bistro selections like Burrata Panzanella, Colorado Lamb Loin and Lavender Pot de Crème. To wash it down, try the Corpse Reviver #2, with Plymouth gin, Cointreau, Lillet Blanc, lemon juice and a mist of absinthe. And in a few weeks, you can keep the evening going under a red-lit ceiling at the soon-to-open club upstairs, which boasts a turquoise and copper smoking lounge...and a separate side-street entrance. In case you do your greenlighting elsewhere.